The first few decades following the Civil War saw little advancement of field botany in Kentucky. Frazee (1869) published a list of medicinal plants, and, during the 1870’s and 1880’s, a series of “county reports” appeared (DeFriese 1877, 1884a,b,c,d; Hussey 1876; Linney 1880, 1882; Crandall 1884). These reports described the general status of the timber resources for these counties and also provided some detail on the general flora, as well as early accounts of remaining old-growth forests. A significant publication during this period was the Ferns of Kentucky by John Williamson (1878); it was the first such state fern flora in the United States according to Cranfill (1980). No doubt botanical explorers from other states passed through Kentucky and made collections during this period, but the amount and degree of this activity are difficult to estimate. The pre-eminent Kentucky botanist of this period was an amateur botanist from Bowling Green, Sarah F. Price. 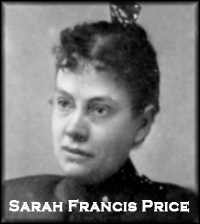 Sarah F. (“Sadie”) Price was an all-round naturalist, publishing over two dozen botanical papers, including a flora of Warren County (Price 1893) and state lists of woody plants (Price 1898) and ferns (Price 1904). She also discovered several new species of plants, several of which were named for her, including Apios priceana, and Aster priceae. Her sudden death at age 54 left many projects unfinished, and some papers were published posthumously (Lovell 1951, 1959). Thus, except for the phenomenal activity of Price, botanical progress in Kentucky during this period was at a relatively low ebb. As the new century began, it had been 65 years since the last publication of C.W. Short, and other than the publication of Williamson (1878) there had been no additional comprehensive state-wide or regional studies.